COMMENTS: This soap mold is basically a large tray mold. This is ideal for melt and pour soap, as it yields very beautiful and fancy looking small soaps. COMMENTS: Worked great, product easy to remove, love these molds !!! COMMENTS: I am new to soap making, so I took a risk and purchased this mold. 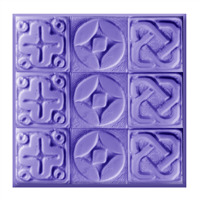 I loved the pattern, but I was doubtful that the soap would easily come out of the mold. I was wrong! I used the clear glycerin with crimson sparkle and spiced cranberry scent. They removed easily, were lovely, and made me look like a pro! I can't wait to make more in a variety of colors. COMMENTS: This mold is perfect for my lotion bars. They release so easily and the designs on top are just beautiful. COMMENTS: This mold is easy to use, makes beautiful soaps and because of the design, makes coloring the individual soap fun and easy. Each batch of soap is never the same, no matter how you use it. 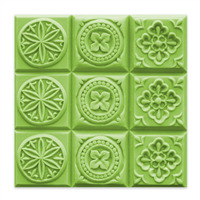 It allows you to be as creative and fancy as you want to get while molding your soaps into a beautiful bar, each time! COMMENTS: I sell a lot of these shapes in CP made in a variety of FO's. Great for florals and spa scents. COMMENTS: This mold makes beautiful soaps. I love the designs. COMMENTS: Very nice mold, makes lovely looking soap. Easy to unmold. 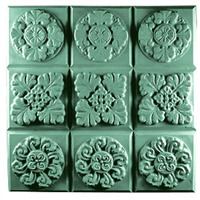 COMMENTS: This mold makes beautiful soaps and very easy to pop out when hardened. I wish it was all individual sections rather than being one large brick that has to be cut into smaller soaps. "3 Butter Melp and Pour with shavings." COMMENTS: I used the 3 butter M&P with the molds as well as Mica (Fairy Dust and Glitter). First grated red glycerin soap that didn't sell during Easter into a plastic bag, added the Mica and glitter, then poured a small amount of peppermint EO into the ziplock back with a pocket of air. I shook the bag until everything was coated with the sparkles and peppermint EO, sprinkled a few of the red shavings at the bottom of the mold. Meanwhile I melted the 3 bitter soap, adding mice and glitter as well as peppermint EO. Let the M&P cool a bit and then sprayed the shavings with alcohol, and ladled one full scoop over the shavings carefully. Sprayed alcohol again, and continued carefully ladling the M&P into the molds. When finished, the bars gave the appearance of peppermint candy. These flew off the shelf!! • Creamy smooth, easy to work with. COMMENTS: One of my favorites. Have used it for CP soaps. Unmolds easily and cleanly -- much better than I expected. People love the design! COMMENTS: This make classy soaps and they have sold well and the mold is holding up well to multiple uses. COMMENTS: These makes the most beautiful soaps! The design's intricate detailing is gorgeous! "I would like to make square bath bombs. Can you tell me if this mold and others like it would be suitable to pack bath bomb mixture into and turn out nice square bath bombs? I'm worried about being able to pack it firmly without distorting the shape." Staff Answer We have never used this type of mold to make bath bombs but it may be difficult to use for this purpose. You can pack the mixture in but when it is unmolded, the squares might break apart when you try to cut them.